For the last five years, I’ve spent one Saturday in January at a unique sporting event that induces anxiety, quickens the pulse and triggers a few tears. 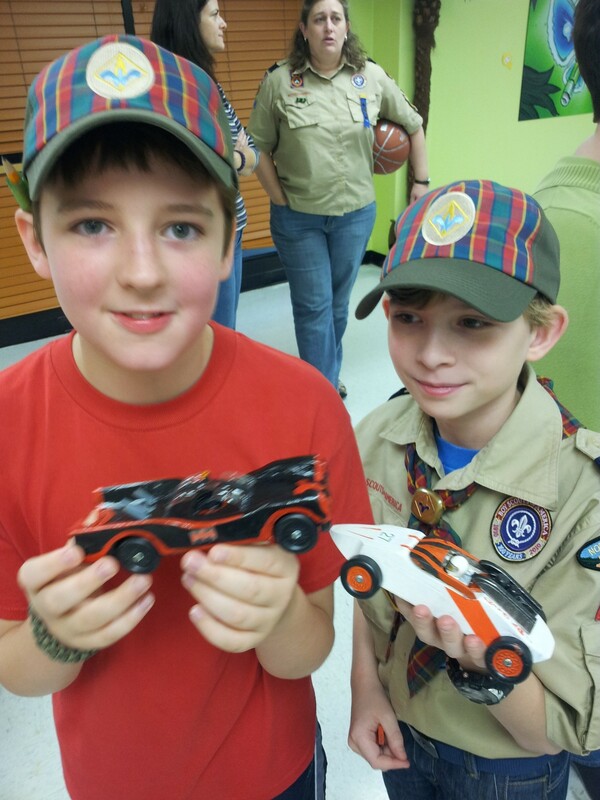 Of course I’m talking about the annual Cub Scout Pinewood Derby. Harris and Barron hard at work turning their blocks of wood into works of art... fast art. This anachronistic competition is a throw-back to the days when kids made their own toys out of what they found lying around. In an era when everything is plastic and comes with detailed picture instructions, the Pinewood Derby challenges kids to use their imagination and show dexterity with sharp implements. It’s a simple concept: You get a block of wood. That’s it. Oh, and four small nails and four plastic wheels. It’s an intimidatingly blank canvas. Pinewood Derby makes me anxious because I am not a woodworker. I do not possess woodworking tools. I do not possess woodworking skills. We have relied on the help of our friends, Jeff and Christine, who have been gracious with their time, expertise and equipment. They help us get the body of the cars into their basic shapes, so the boys can go to town on them with files, sandpaper and paint to achieve their artistic vision. Barron's 1966 Batmobile and best bud Noah's Mach 5 of Speedracer fame. Each year, my oldest son, Barron, has come up with designs that flow right out of his interests. The first year it was a Jeff Gordon replica car straight from his NASCAR obsession. A week after a visit to Sea World in Orlando, he came up with a Shamu car, complete with dorsal fin. After “riding the Ducks” at Stone Mountain he conceived of the amphibious “Duck” vehicle. Beginning guitar lessons last year produced an instrument on wheels. This year he reproduced the 1966 Batmobile, which ran pretty well and received lots of attention from the dads, if not their sons, who remembered watching the old Batman series as kids. 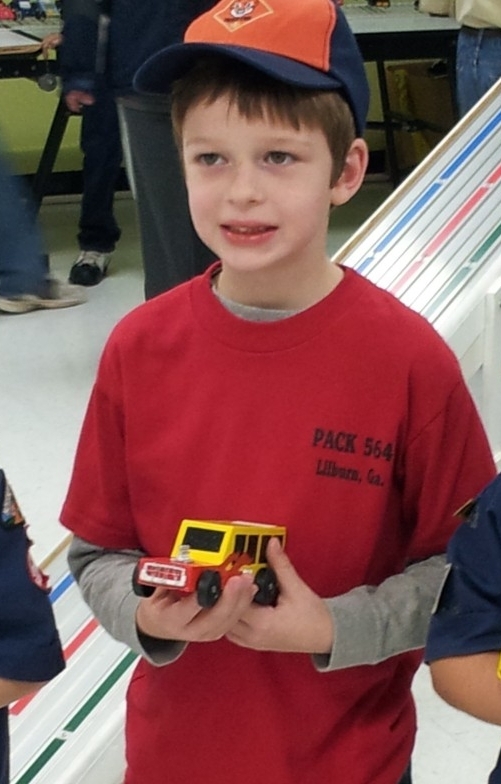 This year was Harris’ first foray into the world of Pinewood Derby. Like all second-born children, he benefitted from his brother’s experience. I still have nightmares about Barron’s first year. I felt like a terrible parent as I watched Barron stand, dejected, at the foot of the race track while Jeff Gordon didn’t have enough weight to roll down to the finish line. I hadn’t done the research from among the myriad websites to help him be at least moderately successful. Despite the forced smile, Harris really was thrilled to earn second place for "showmanship" among the Tiger cubs for his hot rod school bus. This time around, we were ready. Harris’s hot rod school bus did well, earning a second place in showmanship among all the Tiger cubs and first place in speed for our den. His flaming bus may not be sanctioned by the Gwinnett County School Board, but it will get you to school on time. All told we probably spent 20-30 hours on this year’s cars, including helping Carlton with his car. Carlton’s idea of working on his car was putting five coats of paint on the pine block, each a different color. Overall it was a great morning at the races. Our nerves gave way to laughs as we spent time with friends. The boys displayed good sportsmanship, pulling for their buddies and not throwing tantrums when their cars weren’t the fastest. 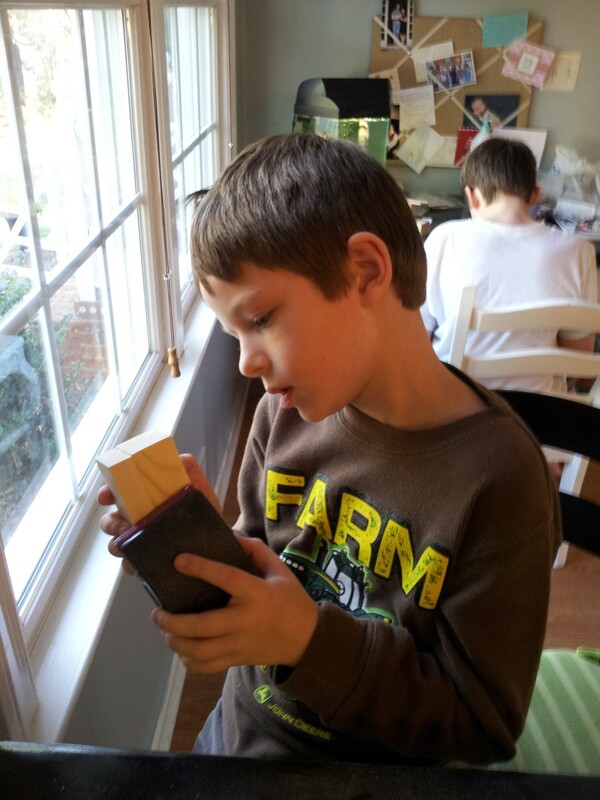 After five years I’ve finally figured out the magic of the Pinewood Derby – time. It’s all about the time Barron, Harris, Carlton and I spent together hacking at, sanding, painting and sealing a block of wood. Like the race itself, life passes all too quickly. What matters most isn’t finishing first. It’s building what it takes to get you to the finish line. This entry was posted in Uncategorized and tagged Batman, Batmobile, Boy Scouts of America, Carlton, contemporary South, Cub Scouts, guitar, Harris, hot rod, Jeff Gordon, Lance Elliott Wallace, Lance Wallace, New South, New South Essays, NewSouth, parenting, Pinewood Derby, school bus, South, Southern, Southern Culture, Southern Living, Southerners, Stone Mountain, The Ducks, the South. Bookmark the permalink. My 6 year old would love something like this. That is one great way for young minds to brew some amazing creativity. Cool post! Love it! You’re so right…life passes by too quickly. You are making wise choices with your time. You and Carla are wonderful parents!